The main focus for the day was the release of the minutes of the last FOMC meeting. 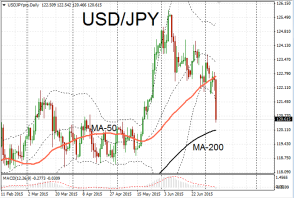 The dollar was relatively flat after the publication as it provided few surprises. The committee saw the economy as being robust enough to withstand a rate increase (possibly in September) while concerns over Greece were raised as expected. Traders were mindful that the minutes are from June’s meeting, before the turmoil in commodities markets and the latest developments over Greece. This week the IMF also raised concerns for a second time over the US raising interest rates too soon. The fund cited global and political threats as a reason for the Fed to hold off on rate rises this year. Also of concern to the IMF is the rising dollar and its impact on emerging nations with heavy dollar dominated debt obligations. EUR/USD consolidated at the 1.10 range with sentiment leaning towards the bullish side. Support was found at 1.0975 and the pair moved upwards towards 1.1090. The next resistance lies around 1.1154 which coincides with the 50-day moving average line. The yen has experienced something of a turnaround this week and has been one of the strongest performers. The Japanese yen is benefiting from safe haven flows as well as a correction of a prolonged bear rally. USD/JPY pushed back down to the 120 range reversing the strong move that pushed it up towards a thirteen year high at 125.85. EUR/JPY dropped over one percent to 133.45. Support is likely at 133.13. Japan saw an unexpectedly high surplus on its current account in May due to stronger exports. The latest eco watch survey was below expectations in June, at 51 against a consensus of 53.2.